In the wake of the deadly devastation of the luxury yacht Persephone, just three souls remain to tell its story—and two of them are lying. Only Frances Mace, rescued from the ocean after torturous days adrift with her dying friend Libby, knows that the Persephone wasn’t sunk by a rogue wave as survivors Senator Wells and his son, Grey, are claiming—it was attacked. To ensure her safety from the obviously dangerous and very powerful Wells family, Libby’s father helps newly orphaned Frances assume Libby’s identity. After years of careful plotting, she’s ready to expose the truth and set her revenge plans into motion—even if it means taking down the boy she’d once been in love with: Grey Wells himself. 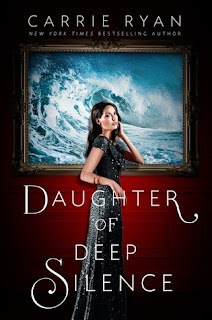 Sharp and incisive, Daughter of Deep Silence by Carrie Ryan is a deliciously smart revenge thriller that examines perceptions of identity, love, and the lengths to which one girl is willing to go when she thinks she has nothing to lose. Frances has just fallen in love with a boy while on a cruise ship. Her family is vacationing on the Persephone and Frances has no greater care in the world than the boy named Grey. That is until disaster strikes and everyone aboard the ship is killed. With sheer luck, Frances and her friend, Libby, end up in a raft that becomes their savior as well as their doom. When Libby's father finally finds them, only Frances is left living. But when they get back to land, Libby is announced as the sole raft survivor and Frances buries her past. Libby cannot let her past go. There are too many unanswered questions. Why were Senator Wells and his son, Grey, lying about that night? What really happened on the Persephone? With all her careful planning, Libby returns home to expose the truth. One way or another, she will get Grey to admit what happened that night. But she soon finds out that emotions buried in the past are closer to the surface than she thinks. Have you ever heard of the show Revenge? How Emily seeks revenge from the powerful Grayson family? Isn't it funny that Grey's full name is Greyson? Yeah, too many parallels here. And while I found the story to be a good mystery that explains things well and goes through the emotions, it still felt like a copycat. I couldn't get over the fact that it was way too similar to this tv show that I like to watch. Both set in beach cities on a beach house with the main character assuming a different identity while seeking revenge. I can't separate the two. While this book is good, I don't feel like it's very original. If you've never seen Revenge, then you won't have the same reservations that I had and will probably like this one.